Doesn't he just look like a swamp creature with slimy, smelly seaweed hanging from his body? 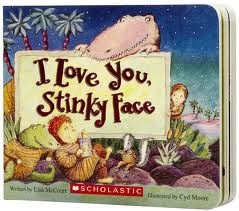 If you're like me you've memorized those lines from the imaginative little tale of I Love You, Stinky Face by Lisa McCourt. 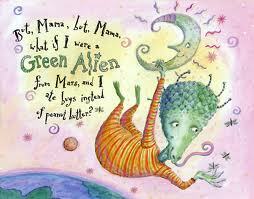 If you aren't familiar with this sweet and humorous children's book, I suggest you get yourself a copy real soon! We've been reading it at bed time since Mack was a wee little stinky face and now we know it by heart. If the title doesn't exactly catch your attention, the story of a curious little boy will. He does a fabulous job of procrastinating bedtime by asking his "Mama" a bunch of creative questions. The little boy asks of his mama, "But, Mama, but, Mama, what if I were a super smelly skunk, and I smelled so bad that my name was Stinky Face? As she lovingly replies, "Then I'd plunk you in a bubble bath! But if you still smelled stinky, I wouldn't mind. I'd whisper in your ear, 'I love you, stinky face.'" The wonderful illustrations by Cyd Moore allow any reader young and old to day dream about life as a scary monster or dinosaur. With summertime in full swing at our house, lunch time routines can get a little boring. The older our son gets the more food choices he would like to make. It's my job to make sure that a balanced meal is going down the hatch! A fun way to extend reading is to make a meal or dessert based around the story. I based this lunch around the imaginary creatures in I Love You, Stinky Face, and had fun doing it. 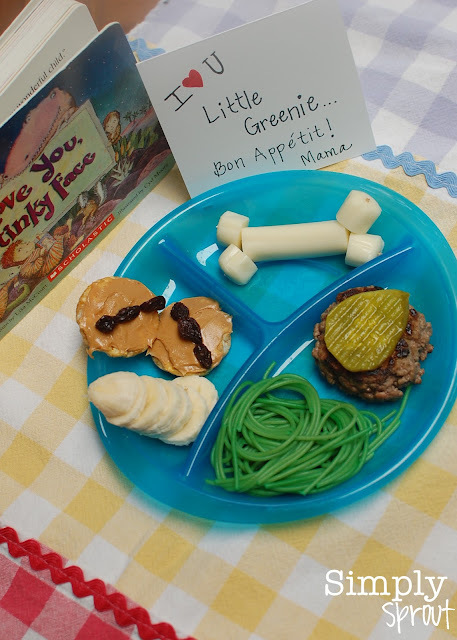 I don't want to give away the whole story, but just a little hint...there's a hamburger lovin' dinosaur (bones out of string cheese and a hamburger patty), an alien that prefers bugs over peanut butter (mini rice cakes with peanut butter and raisins as bugs), an ape (a stack of bananas), and a sea creature (green dyed whole grain pasta for seaweed). 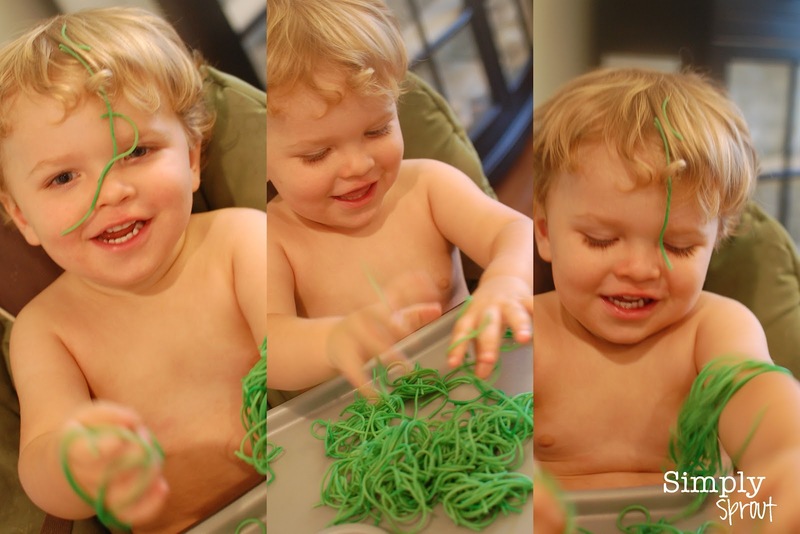 While I was putting together the lunchtime treat, Mack had some tactile fun playing with the leftover spaghetti. It was in his hair, on the walls, and on the floor, but an easy cleanup! This story is silly, but so true. You could cover our little ones in slimy seaweed or have them act like an alien from Mars, and we would still love them the same each and every day. Mama loves you little stinky face!